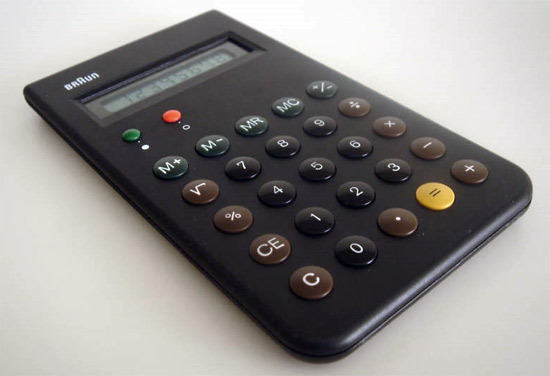 Apple has copied, errr.. been inspired by, many of Braun's designs over the years and the calculator you see above is probably one of the most notable examples. Reincarnated in the first iPhone's calculator app, the iconic ET66 calculator will be once again reborn sometime this year as a re-release. Read on for more details on the re-issue! Originally released in 1987, the ET66 features one of the most iconic designs to date and embodies the "less is more" mantra of renowned designer Dieter Rams. At Basel Fair 2013, an official replica of the BT66 version 2 will be relaunched. The convex circular buttons look to be the same, and the design basically untouched. Pricing and availability details are absent at the moment.